During my SEO and Web Writing training sessions I spend quite a lot of time talking about making websites and content more mobile friendly and one really easy and very quick improvement you can implement is to make your phone number mobile friendly. Having a mobile friendly phone number means that anyone visiting your website from a phone can click on your number and call you with one tap. Easy! If you don’t have a mobile friendly phone number your visitors will need to either write down or copy your number to the phone’s clipboard, close the browser, open the dialler, type in the number and hit dial. Phew! Here’s the really easy way to make your number tappable on all phones. Log into your content management system, you may use WordPress, Joomla or one of the shopping platforms like Magento or Shopify. 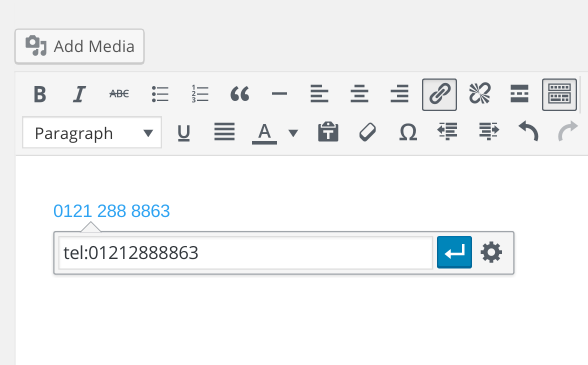 Find your phone number in the editing window, highlight it with your mouse and click the ‘add a link’ button. 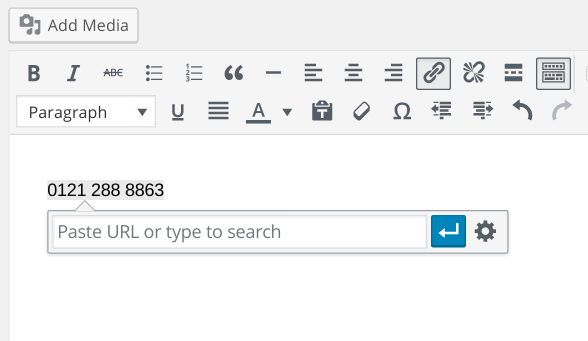 The image below shows the popup in WordPress. Hit the save button and you’re good to go. If you don’t use a content management system and live dangerously with HTML then here’s the result of the above as it appears in the code. It’s just a link. That’s all that needs doing and your phone number will be tappable. With more and more web browsing happening on mobile phones it’s really important to be as mobile friendly as possible. Including a really easy way for people to contact you will also increase the amount of leads generated from your website. If you’re reading this from the UK and fancy some SEO or Web Writing training then get in touch or leave your thoughts in the comments, Twitter or Facebook.